SafeGard CC-3000 – Is the best aluminum conversion coating for powder coating or painting aluminum that will be exposed to extreme environments such as salt, humidity and acid rain. This aluminum oxide coating has also been used as a cost effective replacement for light anodizing for both paint, powder coating, adhesive applications and is RoHS compliant. SafeGard CC-3000 surface treatment has been used effectively with paint and coatings that often have adhesion problems such as: Teflon coatings, high performance high temperature high solids paints, powder coatings, water based and solvent based paints and high strength and thermal adhesives. Chrome-free SafeGard CC-3000 is a unique coating that incorporates the best features conversion coatings and light anodizing creating a coating that will help you to meet both stringent government regulations and the excellent product quality that your customers demand. 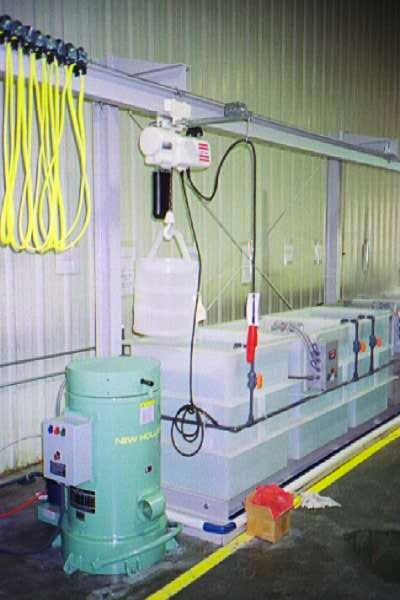 Minimal non-hazardous disposal, increased environmental safety, and lower water costs. 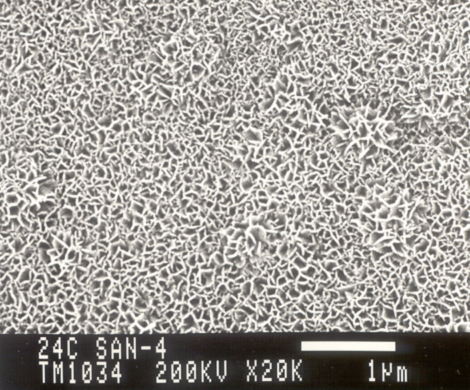 SafeGard CC-3000 reacts with the surface at the molecular level to create a superior bonding surface that securely fastens the paint on and corrosion out (as can be seen in the electron microscope picture below – it looks like metallic Velcro). 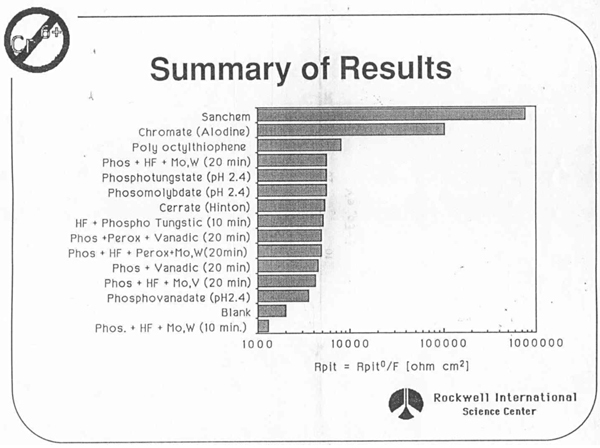 The NADC ran exhaustive series of physical and chemical tests on SafeGard CC-3000 including: Physical performance tests (i.e. salt spray corrosion resistance, filiform, adhesion, etc.) and electrochemical impedance spectroscopy (EIS) were used to analyze pretreatment performance. This product is extremely cost effective. Both the Low initial costs and low depletion rates will give you exceptional bottom line savings. Excellent corrosion resistant coating does not need to be painted but if you change you mind 3 months after treating a part, it can be painted after wiping down the surface. Excellent high temperature stability: the NADC subjected aluminum to an intense heat of over 350°F for over 3 hours, with no negative effect. Not affected by the out-gassing of casting. SafeGard CC always goes at an even thickness, will not puddle or mud crack. The paint aluminum castings above were pretreated with either Sanchem CC-3000 surface pretreatment or a standard alodine chromate. These castings were then heated to various temperatures ranging from 150°F to 350°F to outgas the aluminum castings before they paint aluminum. After painting the aluminum panels, they sent the panels to a tidal area in the Florida Keys for a side by side aluminum corrosion test for a period of 6 weeks. 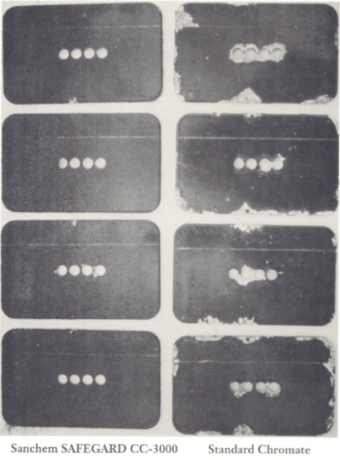 The conclusion was that the SafeGard CC-3000 did not fail at any outgassing temperature and the chromate was marginal at the low temperatures and failed at the 3 high temperatures. SafeGard CC-3000 passed the following test at Tiger Drylac, in Austria: Cross Hatch Adhesion ISO 2409/ DIN 53151, Mandrel Bending Test ISO1519/ DIN 53152, Pencil Hardness ASTM D-3363, Impact Test ASTM D-2794, Salt Spray Resistance Test S2130 (3000 hours), Humidity Resistance Test T1000 (3000 hours), Boiling Water Test and Kesternich Test (SO2 Test). Save Money - The coatings overall performance can be increased dramatically with use of the proper pretreatment system. We have found that the use of an excellent cost effective pretreatment can reduce the overall cost of coating because you may able to use a less expensive paint or powder coating and exceed your performance requirements. Using the best metal pretreatment available is the most cost effective way to increase paint or powder coating performance. The importance of the paint or powder coating pretreatment is critical, it is not as simple as just cleaning, blasting or burning off the residual left on the surface from the last processing step. SafeGard CC-3000 is a non-electrolytic applied aluminum oxide coating which will increase the quality of your finishing, reduce your costs and eliminate your environmental hassles.